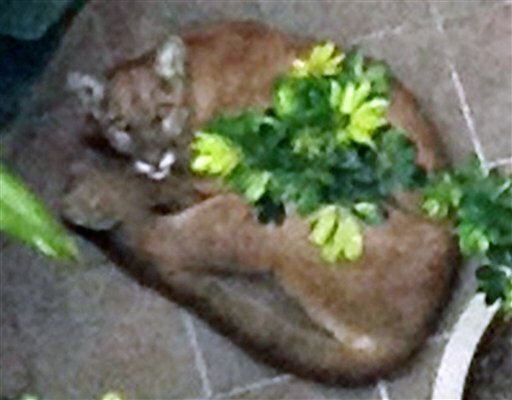 LOS ANGELES: A mountain lion was shot dead on Tuesday when it tried to bolt from police and animal-control officers, called in after the animal strayed into an ocean-front Californian town. The big cat, which at three years old weighed about 75 pounds (34 kg), was spotted in an office courtyard in Santa Monica, near a popular pedestrian shopping street a few blocks back from the ocean west of Los Angeles. The janitor who first saw it around 6:00 am (1300 GMT) called police, triggering a standoff involving several officers and officials from the Department of Fish and Game. "A variety of means were used to try to keep the animal back inside the courtyard area," said Santa Monica police spokesman Robert Almada. "We deployed less-lethal pepper ball, we deployed fire hoses and the animal continued to charge in (an) attempt to flee. Regrettably, the animal was euthanized in order to protect public safety." Mountain lions live in the Santa Monica Mountains and other areas north of Los Angeles, but are rarely seen and even more rarely come down into the sprawling West Coast metropolis itself.